2 bedroom, 2 full bathroom, 1 half bathroom, sleeps 6. Sports Fans? : You won't have to miss your favorite teams with the Giant 60 inch flat screen living room TV with 220 DishNetwork Satellite channels. There are six beaches within 10 minutes, the closest being Cupecoy beach which is a two minute walk from the residence. Casinos, nightclubs and many more restaurants are within a ten minute drive from the property. Honeymoon : Perfect for romantic gettaways. You can have seclusion and privacy or you can do it all being conveniently located to so many beaches, shops, restaurants, ans casinos. Marble tiled, full bathroom with soaking tub and separate shower. Additional Full bathroom available if rented as a two bedroom. Superb! This place rescued my vacation! My family has been a long-time timeshare owner at a nearby resort, and I finally had enough of the situation there. I fired up VRBO, and quickly found this awesome 2 bedroom. Well, all I can say is that it greatly exceeded my expectations! From the finish of the apartment, to the amenities, to the location, it was all way more than I had hoped for. The owner of the condo and the management at Porto Cupecoy were wonderful super helpful, and very responsive. I would absolutely stay there again! Thank you so much!! 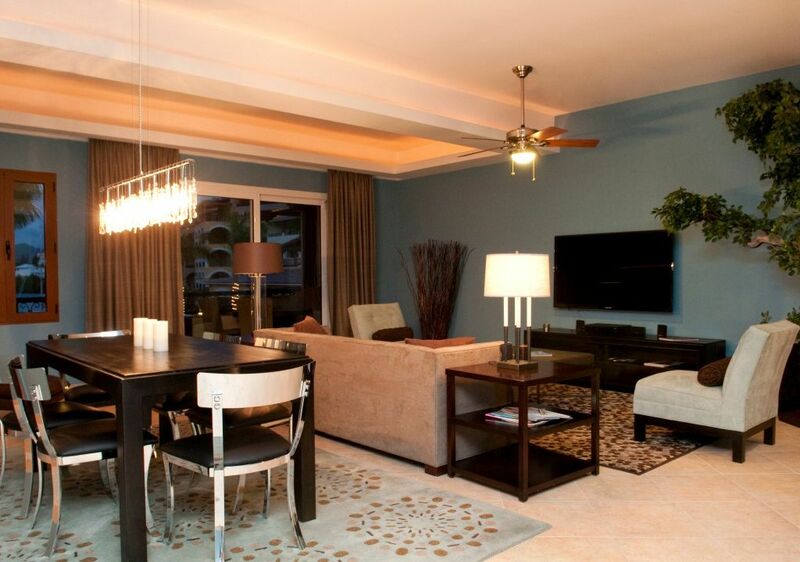 The condo is so beautiful, with a spectacular view of the Marina. With shops and restaurants all over. One of our favorite things to do during our vacations was to cook dinner and eat it outside in the balcony (which is enormous) enjoying the music and the great atmosphere of Porto Cupecoy. Sint Maarten has easily become our favorite destination for summer vacations. And this property is the main reason for it. We REALLY look forward to come back to it after a day at the beach or the island doing different activities. It feels like home. It's so safe (with security 24hrs a day) but also I have to say that in all of our time in the beautiful Sint Maarten, not once, we felt concerned about our safety. Just a big thank you to the owner of this condo in Porto Cupecoy and also to the management of the unit. It is very clear they work together in making your stay a memorable one. So you can concentrate all of your energy in exploring the wonders of the island, French and Dutch sides. Trust me. You won't be disappointed. Once you are done with your time here all you'll want is to secure your next stay. P.S. we are a family of four with kids, ages 12 and 8. So clearly this property works wonders for families but also, I can see how much a couple would enjoy this condo too. I would love to come back only with my wife once. Endless possibilities. My family and I recently stayed at this beautiful unit for a week in July 2016 and couldn't be happier with our stay. The place is furnished with modern and quality appliances and is well taken care of. The owner (John) was very helpful and flexible in arranging our stay, something you don't find too often. The onsite management staff is also very helpful in making sure you have everything you need for a very pleasant stay. What I enjoyed most was the beautiful view from the terrace as I sipped my coffee and watched the sun come up in the morning. So, if you are looking for a clean, quiet and peaceful place to spend your vacation then this is the place. The condo is beautiful, very comfortable and has all amenities. In addition, the complex has a number of very nice restaurants and a great little market. Highly recommend it! starting at 150 per night Holiday rates: Thanksgiving $ 500 per night at a seven night minimum stay. Christmas and New Years at $750 per night minimum of 7 days Heineken Regatta $500 per night at a seven day minimum stay all credit cards are accepted..